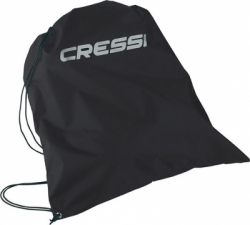 The Cressi Travelight is a lightweight version of a traditional jacket BCD with all around lift to provide good balance and trim under the water and support while on the surface. The overall weight of the Travelight has been reduced by careful selection of strong but light materials to allow the BCD to be packed down into a very small carry bag that is ideal for travelling. The BCD bladder uses a durable internally urethane laminated 210-Denier nylon to provide the necessary strength without adversely affecting the weight and light alloys have been used to make the D-rings in place of traditional stainless-steel. This weight and bulk reduction doesn't mean that the Travelight is unable to support a full integrated weight system with trim pockets. 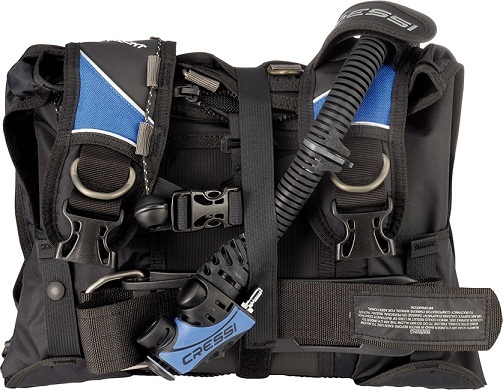 The Cressi Travelight BCD comes with the integrated lock aid quick-release weight system that hold up to 20 lbs. (9 kg), with 10 lbs. (4.5 kg) in each pocket, and two additional rear non-releasable trim weight pockets that help increase-stability in the water. The Travelight is also fitted with more traditional features such as a rear kidney and right shoulder pull dumps, a inflator integrated pull dump on the left shoulder and manual deflation from the inflator assembly. 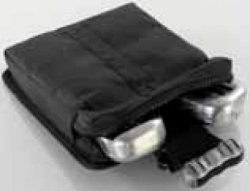 A large zipped pocket can be found on either side of the BCD for convenient storage of accessories. The Travelights harness system uses traditional squeeze-style" quick-release buckles and adjustable straps on the shoulders, chest and waist for precise adjustment -and fit. A hook and loop adjustable waist cummerbund provides extra security and comfort. 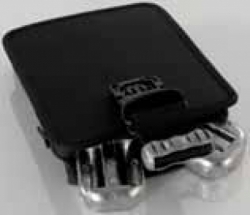 A flexible padded back pad with twin cylinder cam bands provides good back protection and cylinder security while still allowing the BCD to be quickly folded and packed away. The BCD comes equipped with a 3/8" low-pressure hose and provides from 13.5 to 36 lbs. (6.1 to 16.3 kg) of lift and weighs 5 to 6.2 lbs. (2.3 to 2.8 kg). The Cressi Travelight BCD is available in several color options, multiple sizes and comes with an owner's manual.